I don't know about anyone else but I rarely get to enjoy myself these days, with the rush before Christmas being a bit more than chaotic, I'm looking forward to being able to turn my laptop off and taking off my working hat to enjoy the festive holiday with my family and Jezeppi of course. Christmas is a time of many, it's a time to remember the reason for the season if like me you're Christian, it's a time for spending the holiday with our loved ones, sharing presents and eating festive food. It's a time of laughter and joy, it's a time of goodwill and cheer, it's a time to gorge out on lots of chocolate, cheese, crackers and cold meats, it's a time to watch lots of TV, Christmas movies, and it's a time to play games! 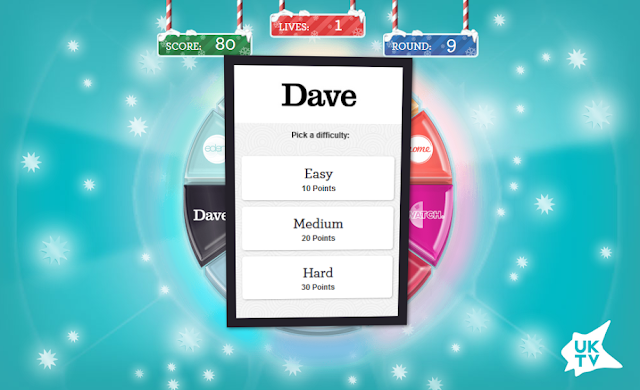 Talking about games, no Christmas is complete without a good old quiz, and if you're like me, and can't make it down to your local, than don't worry because those clever people at UKTV have put together a Christmas quiz like no other! 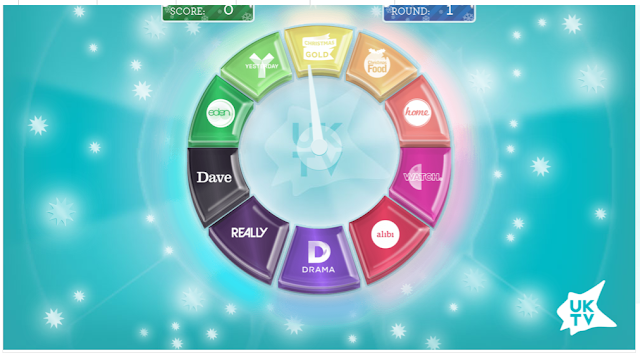 The UKTV Quiz, is filled with questions that all TV addicts will love, asking questions from a selection of TV channels including Dave, Really, Watch, Alibi and Drama to mention a few! Simply press start on the game, and then spin to get your first question on the quiz! Each time, you'll be asked to pick a difficulty level out of Easy (giving you 10 points), Medium (giving you 20 points) and Hard (giving you 30 points). You're given three lives, and for each incorrect answer you get, a life is lost, however, if you get every answer correct, you can go up to so many rounds! For the channels I rarely watch, I always stuck to the easier categories, but for the channels I do watch occasionally, I stuck to either medium or hard, and got to round 12, which I was quite proud of myself as I don't watch a lot of television, and I will admit, some of the questions I did have, I just clicked on any answer as I didn't have a clue! Every question has four answers in the form of A, B, C and D to click on. 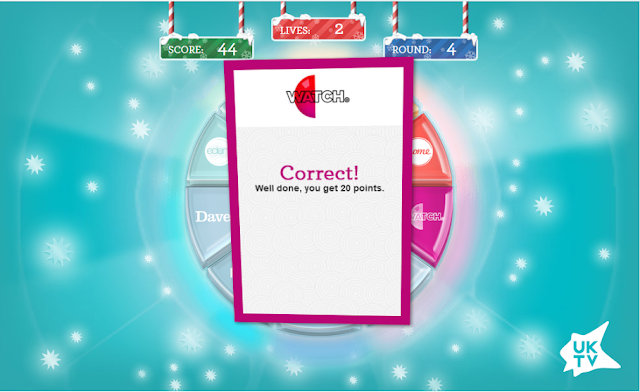 When you've got a correct answer, you'll get a little message pop up saying correct, and letting you know how many points you earned for that question! You can find your total score in the centre at the top of the quiz, along with how many lives you have left, and what round you're on! 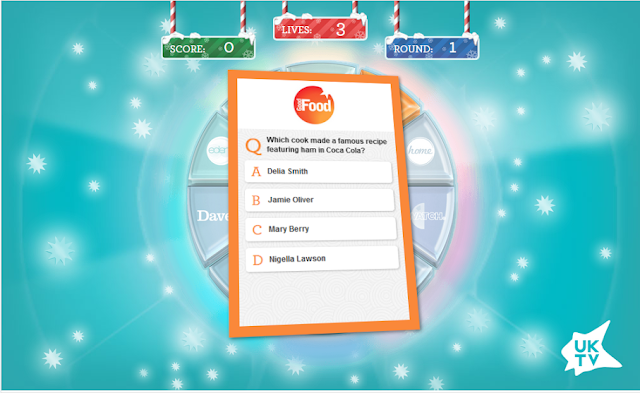 So why not try your luck on the UKTV Christmas Quiz?